Evidence from a small research study—presented at the 2017 Conference on Medicine and Religion in Houston, TX—suggests cultivating Connectedness can help treat depression and anxiety. I developed the Connectedness Evaluation to facilitate diagnosing spiritual health and prescribing tools for better cultivating Connectedness. The evaluation focuses on the four Connectedness relationships (i.e., personal, communal, environmental, and transcendent) by examining how we have previously cultivated these relationships, how we currently cultivate them, and how we would ideally like to cultivate them in the future. 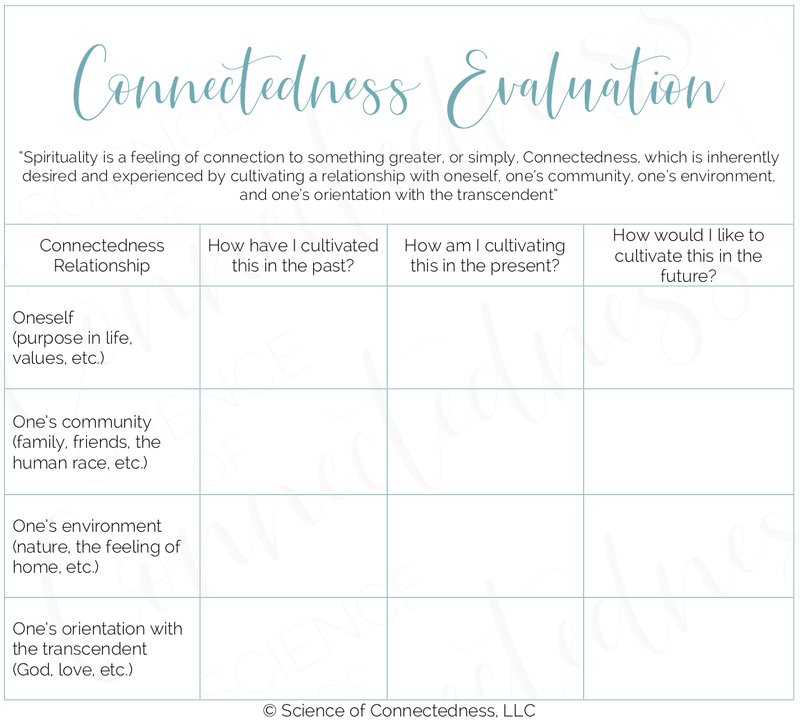 Using the Connectedness Evaluation, we have the opportunity to examine our spiritual well-being, acknowledge patterns, and make goals for the future. It is not uncommon for day-to-day routines to shift toward something that no longer matches our values, interests, dreams, or optimal well-being; yet, we often do not recognize this has happened until we find ourselves discontented and not knowing why. For instance, we may realize that recently spending more time with a group of friends has occurred at the expense of our contemplative, alone time. We may choose to designate more time to our personal Connectedness in the future, or perhaps we will decide the Connectedness arising from our friendships is improving our spiritual health more than the contemplative time and thus choose to continue with the same schedule—except this time the choice will be empowering because we are making it from a place of awareness. 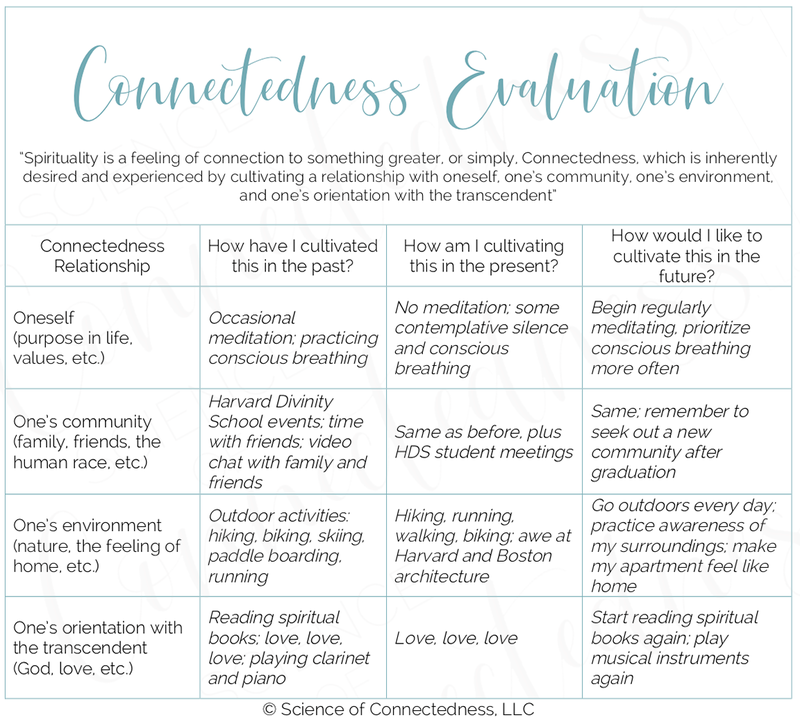 The Connectedness Evaluation can be used to affirm an already healthy spiritual and/or religious life, or it can be used to jumpstart a new, do-it-yourself spirituality unique to you.